Is Vale S.A. a Buy? The mining giant has seen a huge price gain since early 2016. Is it still worth buying? Vale S.A. (NYSE:VALE) is one of the world's largest miners, providing customers with the vital materials needed to support modern and developing economies. It's a necessary business, but it isn't a steady one. Here's what you need to know about the miner today and whether or not you'll want to jump aboard and buy the stock. Vale's business spans a number of key products, including iron ore, nickel, coal, copper, and precious metals, which are largely a byproduct of its other mining efforts. However, iron ore, which is largely used to make steal, is the real driving force, making up around 70% of revenue and accounted for around 80% of adjusted EBITDA in the second quarter -- so the metal's impact on the bottom line is even larger than its impact on the top line. Vale sends the commodities it produces around the world, but the largest end market by far is Asia. That region accounts for nearly 60% of Vale's revenue. China alone can account for as much as 40% of Vale's revenue on a regular basis. Revenue generated in China is at least three times larger than the next closest markets, Japan and Brazil (the miner's home market). So not only is Vale reliant largely on one commodity, but it is also heavily dependent on just one end market as well. The mining industry went through a painful industry downturn not too long ago, pushing Vale's bottom line deep into the red in 2015. However, commodity prices started to pick up again in early 2016 and Vale's results have followed suit. Earnings got back into the black in 2016 and rose an impressive 35% in 2017. The downturn also led to a notable improvement on Vale's balance sheet, with long-term debt falling by nearly 50% between 2014 and 2017. Cost-cutting and asset sales were key drivers here, as the company worked hard to maintain spending on its most important projects while still managing to strengthen its finances. Although a difficult market environment and poor financial results were behind this conservative shift, a typical trend in the cyclical mining industry, the end result is that Vale is on much stronger footing today than it was just a few years ago -- including the start up of a large, low-cost mine (the mine is cryptically called S11D). It's no wonder, then, that the stock price has rocketed higher by more than 500% since early 2016, when commodity prices started to recover. But what should investors do now? The big issues facing Vale from here will most likely be tied to China. That country's growth has been trending lower for many years and demand for iron ore from this one nation has a huge impact on iron ore prices. Both Chinese demand and iron ore prices, in turn, will have a huge impact on Vale's financial results and stock price. One key factor here is that the recovery potential that was present as 2016 began appears to be fully accounted for today. Vale was trading at a discount just a few years ago, but is trading roughly in line with major peers Rio Tinto and BHP Billiton today on key valuation metrics, like price to tangible book value, price to earnings, and price to cash flow. 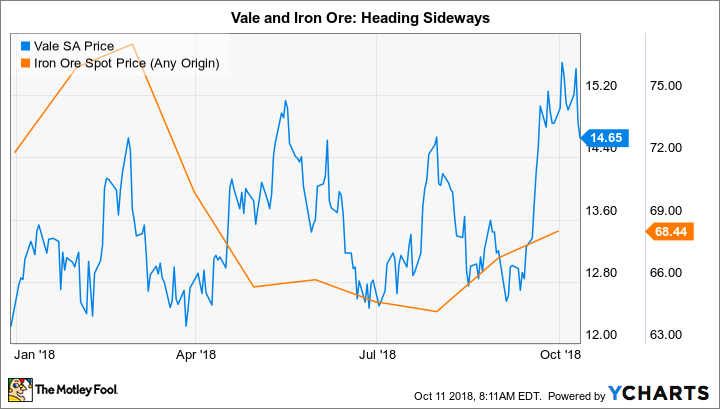 There's no reason to expect further multiple expansion at this point, so Vale's share price will likely trade along with the price of iron ore and economic news out of China, the two main drivers of its business. So far this year, Vale's stock price has gone through a series of ups and downs but is higher, overall, by nearly 25%. Some of its biggest price swings coincided with iron ore prices and Chinese economic news. That gain, meanwhile, is well above the low-single-digit advance seen at BHP Billiton and a price decline of 7% at Rio Tinto. So with a similar valuation and a notably larger price advance, it's hard to get excited about Vale's stock. In fact, sentiment is far more likely to affect shares at this point than valuation. In the end, Vale is probably a decent choice if you are positive about the prospects for global steel demand, in which iron ore is a primary input, and China, but not a good choice if you think slack steel demand will lead to falling iron ore prices or if China hits an economic wall. At the start of 2016, miners across the board were positioned to benefit from a commodity upturn. That helped push Vale's stock higher as its results and financial position improved along with commodity prices. At this point, however, the company's efforts to strengthen its business have largely played out. While it has long-term projects in the works, the real driving force right now is iron ore. Unless you have a strong feeling about the direction of that metal, which is tied to the Chinese market, Vale isn't particularly attractive right now.